With a passion for color and decor Cathy has always been creative. 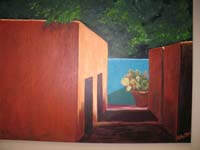 She began painting move than a decade ago studying with Dermott McKeown and has been exploring various subject matter. Cathy explores realism and abstract working in acrylic, oil and mixed media. Cathy paints what inspires her and believes art evokes emotion in both the artist and the viewer. 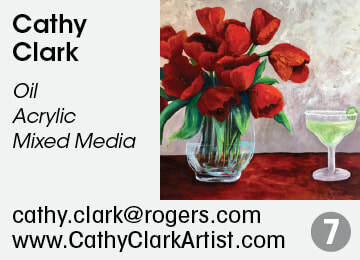 Cathy is a member of Visual Arts Mississauga and Mississauga Arts Council. 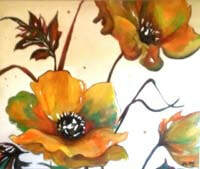 Cathy has had work on display at Harrop House Gallery in Milton and at Sea & Craft Gallery and Framing in Oakville. Acitive in community involvement she frequently donates paintings for auction to organizations such as Alzheimer's Society for Peel, Oakville Hospital Fund, Living Arts Center and has participated in the First Annual "Chair Affair" hosted by the Mississauga Furniture Bank where two of her "artistic chairs" were auctioned to raise money for that organization. Cathy participates in several art shows each year including the Annual Lakeshore Art Trail. As a full time Realtor for Keller William Realty Solutions, Cathy is constantly inspired by changing home decor and often uses her original artwork for home staging.